Boritt, Gabor S., Lincoln and the Economics of the American Dream, (University of Illinois Press, 1944). Lind, Michael, What Lincoln Believed: The Values and Convictions of America's Greatest President, (Anchor, 2006). Luthin, Reinhard H., "Abraham Lincoln and the Tariff", (The American Historical Review, July 1944). Richardson, Heather Cox, The Greatest Nation of the Earth: Republican Economic Policies During the Civil War, (Harvard University Press, 1997). As speaker of the House of Representatives, Clay had taken an active role in shepherding the Tariff Bill of 1816 through to passage – taking particular interest in protection of textile manufacturers. “The home-market idea, national economic independence, the favorable impact of industrialization, and governmental promotion of these conditions all had become basic concepts of the Speaker’s ideology,” wrote biographer Maurice Baxter. In the debate over the 1820 Tariff bill, according to Baxter, Clay “pressed for nurturing manufacturing at a time when American agricultural exports and forcing commerce generally had fallen off. No longer would Europe provide the kind of market prevailing in the prewar period, he warned. But to soften opposition, he sought to reconcile all elements of the economy, thereby achieving national self-sufficiency.”9 Although the bill passed the house, it narrowly failed to clear the Senate. The notion of reconciling divergent parts of the American economy would prevail in the economic thought of Abraham Lincoln. Lincoln stressed economic issues during the campaign, but voters were more interested in campaign hype and hoopla. Historian Charles Manfred Thompson wrote: “Although the Illinois Whigs declared for a protective tariff, they did not press it on the voters as a vital issue during the campaign of 1839-40, apparently for the reason that the people of Illinois naturally favored a moderate tariff of the type of the one of 1846. Instead they relied for success on persuading the voters that [William Henry] Harrison was their logical candidate, and that Van Buren was unworthy of re-election.”30 Whigs characterized the well-born Harrison as a man of the frontier while Van Buren was portrayed as an effete easterner. Harrison won but died shortly after he took office. Clay-led Whigs soon split with Harrison’ successor, John Taylor. In control of Congress in 1842, Whigs passed a strong protective tariff. Historian Yonathan Eyal wrote that the 1833 tariff “compromise that end that [nullification] crisis projected a reduced tariff schedule through 1842, and at that point Whigs took advantage of the lapse to pass a new set of duties that would help the manufacturing classes.”31 Thus in the presidential election of 1844 the tariff was once again a central economic issue. Larry Schweikart and Michael Allen wrote that “two bills came out of the Whig Congress in 1842 to delay the reductions, and…Tyler vetoed them both. With his shrinking constituencies about to abandon him, Tyler conceded on a third bill that delayed some tariff reductions, but at the same time ended plans to distribute federal revenues to the states. Tyler not only managed to make himself unpopular, but by forcing concessions, he also eliminated the few bones that the Whigs had hoped to throw to southern interests.”32 Taylor had unwittingly thrown Washington politics into an uproar. Clay sought to capitalize on this achievement with another run at the presidency in 1844. It was in 1844 this campaign for president that Lincoln honed his economic arguments regarding the tariff. Historian Olivier Frayssé wrote: “Of all the Illinois Whigs, Lincoln was the only one (or almost the only one) who dealt with the issue of the tariff in electoral meetings in 1840. Once again, he demonstrated his political courage by going against the general opinion of rural Illinois. In 1843-44 he perhaps took advantage of the rise in agricultural prices, particularly of wool, in comparison to the general index of prices. The rise, which coincided with the adoption of a Whig tariff in 1842, increasing duties by an average of 34.4 percent, made it possible to describe the short-term advantages of protectionism for the farmer. This concern will be found again in Lincoln’s efforts in Congress to obtain protection for American hemp.”35 It was vitally important to demonstrate that the tariff was advantageous rather than injurious to farmers on America’s frontier. Mr. Lincoln’s economic views didn’t change during this period, but his views on what was politically vital to the country did adapt. A 1858 campaign pamphlet in Illinois stated: “Mr. Lincoln stands on the Old Whig Platform, with Clay and Webster.” Historian Gabor S. Boritt noted, however, that Lincoln disdained to talk about the tariff in 1858 Senate campaign with Senator Stephen A. Douglas. “When the Chicago Journal tried to introduce the issue into the Great Debates, he turned a cold shoulder towards it. He refused to mention the subject even when the occasion seemed to call for it.” Lincoln had changed his political priorities as well as his perception of what issues would hold the nascent Republican Party together. Boritt wrote: “In ideological terms slavery was the supreme issue for him because he feared that is extension would strangle the American Dream. Tackling economic policies, however complementary onto his antislavery principle meant to him, as to the radicals, ‘lowering the Republican Standard’ and diluting its moral authority.”93 For Lincoln, opposition to slavery was a matter of economic justice as well as human equality. It was also a matter of political viability. Still, the tariff issue lingered. Financial journalist Steven R. Weisman noted that “without tariffs, the United States would have made a much slower transition from its status as a nation with an agrarian-based economy, rich in resources but lacking in capital investment, into the mighty industrial power it became after the Civil War. Debates about the tariff rose and fell throughout the nineteenth century, but without significant damage to the broad consensus in their favor. Democrats supported what Andrew Jackson termed a ‘judicious tariff,’ while Whigs, and later Republicans, pushed for higher tariffs to protect industries to fulfill their vision of development and enrich their political base. In the 1840s and 1850s, the anti-tariff forces managed to keep trade barriers reasonably low.”94 Under southern pressure, Congress in 1857 again revised American tariffs downward. Historian Richard Hofstadter wrote: “The tariff of I857 was the lowest tariff enacted by Congress since 1816. The attitude of manufacturers toward that bill should serve as an index of the vitality of the tariff issue in the North. The record reveals that outside of Pennsylvania Northern industry offered no serious opposition to reduction. On the contrary, the reductions were welcomed. This was not because manufacturers were reductionists in principle, but because political exigencies led them to seek lowered duties on raw materials as a substitute for direct protection.”95 The legislation was passed shortly before a severe worldwide panic hit in the late summer of 1857 – causing some northerners to rethink the wisdom of the tariff reductions and some Republicans to seek to revive it as a political issue. While Lincoln was downplaying the tariff, the issue was contributing to increasing sectional division. Allan Nevins noted: “Until now [the late 1850s], however, the debate had been languidly intermittent., for most Whigs had been as moderate as sucking doves. Such men as Tom Corwin, J. J. Crittenden, and even Horace Greeley stood not for head-high but merely breast-high protection.” Nevins noted: “The basic argument of the Whig-Republican protectionists was that the United States ought to produce its own iron, cloth, and most other manufactured commodities; that this could not be done while European wares came in unchecked floods; and that, when home manufactures once gained vigor, they would benefit American products of raw materials far more than any European markets could. No nation, they argued, had ever grown rapidly in wealth, power, intelligence, and arts while exporting raw materials and importing finished goods. On the contrary, such nations had always been impoverished.”97 Strong pressure was growing from the iron and textile industries for greater tariff protection. I am here, just now, attending court. Yesterday, before I left Springfield, your brother, Dr. William S. Wallace, showed me a letter of yours, in which you kindly mention my name, inquire for my tariff views; and suggest the propriety of my writing a letter upon the subject. I was an old Henry Clay tariff whig. In old times I made more speeches on that subject, than on any other. I have not since changed my views. In old times I made more speeches on that subject, than on any other. I have not since changed my views. I believe yet, if we could have a moderate, carefully adjusted, protective tariff, so far acquiesced in, as to not be a perpetual subject of political strife, squabbles, changes and uncertainties, it would be better for us. Still, it is my opinion that, just now, the revival of that question, will not advance the cause itself, or the man who revives it. I have not thought much upon the subject recently; but my general impression is, that the necessity for a protective tariff will, ere long, force it’s old opponents to take it up; and then it’s old friends can join, and establish it on a more firm and durable basis. We, the old whigs, have been entirely beaten out of the tariff question; and we shall not be able to re-establish the policy, until the absence of it, shall have demonstrated the necessity for it, in the minds of men heretofore opposed to it. I have now just returned from a call upon Mr. [Thaddeus] Stevens with whom I had a very free conversation in regard to you & your views upon the Tariff – no one else being present. He commenced by saying that he was satisfied from what he had heard of you that you were all right upon that subject, though he would himself have preferred that the Chicago Platform had been considerably stronger upon the point. It was the all absorbing question here in Pennsylvania. He wished that they could get hold of a speech that you had published upon that subject before your nomination. I then told him of the conversations which I had had with you, by which he declared himself much gratified. I then told him that I had been authorized to show him the heads of your speech, but had unfortunately been hurried away without them. He expressed a very strong desire to see them, and thought that they might be of great service in the absence of a published speech of older date, or a set of Resolutions which I told him I had heard from Mr. [William Henry] Bailache might, possibly, be obtained. That, while providing revenue for the support of the General Government by duties upon imposts, sound policy requires such an adjustment of the imposts as to encourage the development of the industrial interest of the whole country, and we commend that policy of national exchanges which secures to the working men liberal wages, to agriculture remunerating prices, to mechanics and manufacturers an adequate reward for their skills, labor and enterprise, and to the nation commercial prosperity and independence. Like Clay, Wayland and Carey, Lincoln was seeking harmony of the country’s economic interests and seeking to straddle political differences on the tariff issue. German-American journalist Henry Villard, who accompanied Lincoln on his pres-inaugural trip, recalled: “The least creditable performance en route was his attempt to say something on the question of tariff legislation in his Pittsburg speech. “What he said was really nothing but crude, ignorant twaddle.” It proved him to be the veriest novice in economic matters, and strengthened my doubts as to his capacity for the high office he was to fill. So poor was his talk that most of the Republican papers, while they printed it, abstained from comment.”131 Historian Michael Burlingame concurred, stating: “Somewhat lamely Lincoln addressed the tariff issue.”132 Lincoln, however, probably was trying to balance strike a balance within the Republican Party – between pro-tariff former Whigs and anti-tariff former Democrats and to avoid antagonizing the South on yet another issue besides slavery. During his pre-inaugural trip, Lincoln only touched on the tariff issue in Pennsylvania, where pro-tariff voters had helped elect him. Of all the measures now before the Senate, that, however, is the one that seems to have the greatest ardent friends — the Pacific Railroad bill & the Homestead bill, the tendencies of which, as regards increase of wealth or strength, are directly the opposites of protection, being likely to become laws, while the Tariff bill goes over to another session. Nevertheless, the success of your administration is wholly dependant upon the passage of the Morrill bill at the present session. With it, the people will be relieved – your term will commence with a rising wave of prosperity – the treasury will be filled – and the party that elected you will be increased and strengthened. Without it, there will be much suffering among the people – much dissatisfaction with their duties – much borrowing on the part of the Government – & very much trouble among the republican party when the people shall come to vote two years hence. There is but one way to make the party a permanent one, & that is, by the prompt repudiation to the free trade system. The grand difficulty of opposition administrations, thus far, has been that they have been obliged to wait two years before they could carry out the wishes of those by whom they had been elected. The Harrison & Tyler period is the most calamitous of our history, & for the principle reason that no changes could be made before 1842, just in time to put the country in order for Mr Polk . But pass the tariff now, & you will pass it in 1862, just in time for the democrats who will succeed you. Had it been possible to pass the bill of 1842 in February 1840, Mr Polk would never have been elected.- Your friends have now the chance of doing this, & they will do it, if you should insist upon it. If you do not, I doubt greatly if it will be done. Had the policy advocated by Mr Clay, as embodied in the tariff of 1842, been maintained, there could have been no secession, and for the reason that the southern mineral region would long since have obtained control of the planting one. If now maintained – if measures be now adopted for enabling the people of the hill country to profit of our present tariff – and if capitalists can have such assurances of its permanence as is required for securing the creation of mills and furnaces, and the opening of mines — we may retrace our steps and thus secure the permanent maintenance of the Union. If, on the contrary, our people left in doubt as to the purposes of the Administration, are compelled at each succeeding session of Congress to fight for life, and if, finally, the British free trade system be readopted – the Union must, before the lapse of may years, be rent into numerous fragments, mere instruments in the hands of foreign powers. From this, there can be no escape. “In the White House, wrote historian Gabor S. Boritt, “Lincoln followed his ‘political education’ to the point where he managed not to directly mention the tariff at all in official messages. He did not have to. Congress passed tariff increase after increase and he signed them into law. Rates reached unprecedented and previously unimaginable heights. They were made frankly protectionist.”141 One economic consequence was a dramatic increase in the manufacturing capacity of the North as the labored to meet military needs. About such an industrial expansion, President Lincoln cannot have been displeased. Roy P. Basler, editor, Collected Works of Abraham Lincoln (CWAL), Volume IV, p. 49 (Letter from Abraham Lincoln to Edward Wallace, May 12, 1860). Michael Burlingame, Abraham Lincoln: A Life, Volume I, p. 573 (Chester County Times, February 11, 1860). Douglas L. Wilson and Rodney O. Davis, Herndon’s Informants, p.171. CWAL, Volume IV, p. 211 (Speech in Pittsburgh, February 11, 1861). Norton Garfinkle, “Lincoln and the Coming of the Civil War: The Fight for a Middle-Class Society”, Lincoln Herald, Winter 2009, p. 281. Paul Finkelman and Donald R. Kennon, editors, Congress and the Emergence of Sectionalism from the Missouri Compromise to the Age of Jackson, p. 49, 52 (Peter S. Onuf, “The Political Economy of Sectionalism”). Phillip S. Paludan, “A People’s Contest”, p. 129. John G. Nicolay and John Hay, Abraham Lincoln – A History, Volume I, p. 102. Maurice Baxter, Henry Clay and the American System, pp. 21, 23. Harry Ammon, James Monroe: The Quest for National Identity, p. 540. James F. Hopkins, editor, The Papers of Henry Clay, (Speech on Tariff, March 30-31, 1824). Maurice Baxter, Henry Clay and the American System, p. 28. Larry Schweikart and Michael Allen, A Patriot’s History of the United States, p. 204. Robert V. Remini, The Edge of the Precipice: Henry Clay and the Compromise that Saved the Union, pp. 12-13. Robert V. Remini, The Edge of the Precipice: Henry Clay and the Compromise that Saved the Union, p. 23. Michael F. Holt, The Rise and Fall of the American Whig Party, p. 21. Forrest McDonald, State’s Rights and the Union: Imperium in Imperio, 1776-1876, pp. 109-110. Robert V. Remini, Henry Clay: Statesman for the Union, p. 386. Robert V. Remini, The Edge of the Precipice: Henry Clay and the Compromise that Saved the Union, pp. 26-27. Jon Meachan, American Lion: Andrew Jackson in the White House, p. 243. Charles Sellers, The Market Revolution: Jacksonian America, 1815-1846, p. 330. Merrill D. Peterson, The Great Triumvirate: Webster, Clay, and Calhoun, p. 225. Walter A. McDougall, Throes of Democracy: The American Civil War Era, 1829-1877, p. 72. Merrill D. Peterson, The Great Triumvirate: Webster, Clay, and Calhoun, p. 230. Merrill D. Peterson, The Great Triumvirate: Webster, Clay, and Calhoun, p. 227. Douglas L. Wilson and Rodney O. Davis, editors, Herndon’s Informants: Letters, Interviews and Statements About Abraham Lincoln, p. 202 (Letter from Robert L. Wilson to William H. Herndon, February 10, 1866). William H. Herndon and Jesse W. Weik, Lincoln’s Life of Herndon, pp. 130-131. Douglas L. Wilson and Rodney O. Davis, editors, Herndon’s Informants: Letters, Interviews and Statements About Abraham Lincoln, p. 388 (John B. Weber interview with William H. Herndon, ca. November 1, 1866). Charles Manfred Thompson, The Illinois Whigs before 1846, p. 73. Yonathan Eyal, The Young America Movement and the Transformation of the Democratic Party, 1828-1861, p. 83. Larry Schweikart and Michael Allen, A Patriot’s History of the United States, p. 236-237. Michael F. Holt, The American Whig Party, p. 166. Paul Studenski and Herman Edward Krooss, Financial History of the United States, p. 117. Olivier Frayssé, Lincoln Land, and Labor: 1809-60, p. 101. Michael Lind noted: “Between the 1820s and the 1840s, Clay promoted the American System, from which he financially benefited as a grower of protected hemp for ropes. Under the leadership of Clay, the 1816 tariff was revised to protect American industries. Imports on all manufactured goods averaged 40 percent while tariffs on imported agricultural products were also increased – in some cases amounting to 60 percent.” Michael Lind, What Lincoln Believed: The Values and Convictions of America’s Greatest President , p. 82. Yonathan Eyal, The Young America Movement and the Transformation of the Democratic Party, 1828-1861, p. 49. Yonathan Eyal, The Young America Movement and the Transformation of the Democratic Party, 1828-1861, p. 91. Arthur M. Schlesinger, Jr., The Age of Jackson, p. 423. Michael F. Holt, The American Whig Party, pp. 167, 183-184. Michael Burlingame, Abraham Lincoln: A Life, Volume I, p. 224. Michael Burlingame, Abraham Lincoln: A Life, Volume I, p. 227. Charles Manfred Thompson, The Illinois Whigs Before 1846, p. 122. CWAL, Volume I, pp. 311-312 (Campaign Circular from Whig Committee, March 4, 1843). Emanuel Hertz, editor, The Hidden Lincoln, p. 79 (Letter from William H. Herndon to Ward Hill Lamon, March 6, 1870). 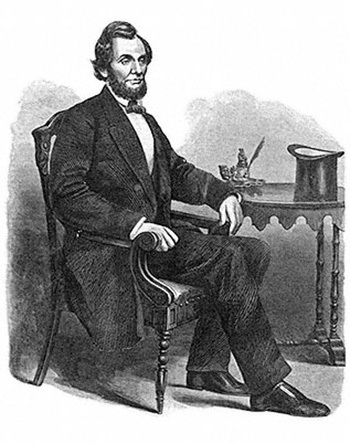 Douglas L. Wilson and Rodney O. Davis, editors, Herndon’s Informants: Letters, Interviews and Statements About Abraham Lincoln, pp. 451-452 (James Gourley interview with William H. Herndon, ca. 1865-1866). Douglas L. Wilson and Rodney O. Davis, editors, Herndon’s Informants: Letters, Interviews and Statements About Abraham Lincoln, p. 464 (William H. Herndon interview with Turner R. King, ca 1865-1866). Herbert Mitgang, editor, Abraham Lincoln: A Press Portrait, p. 44 (Illinois State Register, March 22, 1844). Herbert Mitgang, editor, Abraham Lincoln: A Press Portrait, p. 45 (Illinois State Register, March 29, 1844). Herbert Mitgang, editor, Abraham Lincoln: A Press Portrait, p. 44 (Sangamo Journal). Emanuel Hertz, editor, The Hidden Lincoln from the Letters and Papers of William H. Herndon, p. 79. CWAL, Volume IV, p. 125 (Letter from Abraham Lincoln to James E. Harvey, October 2, 1860). Michael Burlingame noted that in response, “Harvey’s newspaper, the Philadelphia North American and United States Gazette, heaped praise on Lincoln’s tariff stand.” Michael Burlingame, Abraham Lincoln: A Life, Volume I, p. 650.) Burlingame noted that “Pennsylvanians wanted to see the text of speeches Lincoln had delivered on protection during the 1840s, but because newspapers at that time did not carry full accounts of political addresses he had no texts for them.” Michael Burlingame, Abraham Lincoln: A Life, Volume I, p. 663. Rufus Rockwell Wilson, editor, Intimate Memories of Lincoln, p. 191 (Thomas Pickett). Robert W. Johannsen, Stephen A. Douglas, p. 832. Jeriah Bonham, Fifty Years’ Recollections, pp. 158-159. Jeriah Bonham, Fifty Years’ Recollections, pp. 159-160. Michael Burlingame, Abraham Lincoln: A Life, Volume I, p. 228. Yonathan Eyal, The Young America Movement and the Transformation of the Democratic Party, 1828-1861, p. 49, 43. Emanuel Hertz, editor, The Hidden Lincoln from the Letters and Papers of William H. Herndon, p. 117 (Letter from William H. Herndon to Jesse W. Weik, January 1, 1886). Gabor S. Boritt, Lincoln and the Economics of the American Dream, p. 176. Walter A. McDougall, Throes of Democracy: The American Civil War Era, 1829-1877, p. 140. Gabor S. Boritt, Lincoln and the Economics of the American Dream, pp. 180-181. Michael Lind, What Lincoln Believed: The Values and Convictions of America’s Greatest President, p. 80. Robert Bray, Reading with Lincoln, pp. 245-246. Stewart Winger, “Lincoln’s Economics and the American Dream: A Reappraisal”, Journal of the Abraham Lincoln Association, Winter 2001, p. 70. Rodney J. Morrison, Henry C. Carey and American Economic Development, pp. 41-43. Rodney J. Morrison, “Henry C. Carey and American Economic Development”, Transactions of the American Philosophical Society, 1896, p. 58. Arthur M. Lee, “Henry C. Carey and the Republican Tariff”, The Pennsylvania Magazine of History and Biography, (July 1957), p. 282. Arthur M. Lee, “Henry C. Carey and the Republican Tariff”, The Pennsylvania Magazine of History and Biography, (July 1957), pp. 281-282. Fred Kaplan, Lincoln: The Biography of a Writer, p. 170. Gabor Boritt, Lincoln and the Economics of the American Dream, p. 109. Fred Kaplan, Lincoln: The Biography of a Writer, p. 171. Michael Burlingame, Abraham Lincoln: A Life, Volume I, p. 248. Gabor S. Boritt, Lincoln and the Economics of the American Dream, p. 143. John S. Wright, Lincoln and the Politics of Slavery, p. 69. Heather Cox Richardson, The Greatest Nation on Earth, p. 104. Eric Foner, The Fiery Trial: Abraham Lincoln and American Slavery, p. 135. Gabor S. Boritt, Lincoln and the Economics of the American Dream, pp. 191, 175. Steven R. Weisman, The Great Tax Wars: Lincoln to Wilson–The Fierce Battles over Money and Power That Transformed the Nation, p. 14. Richard Hofstadter, “The Tariff Issue on the Eve of the Civil War”, American Historical Review, October 1938, p. 50. Allan Nevins, The Emergence of Lincoln: Douglas, Buchanan, and Party Chaos, 1857-1859, p. 402. Allan Nevins, The Emergence of Lincoln: Douglas, Buchanan, and Party Chaos, 1857-1859, p. 221. Arthur M. Lee, “Henry C. Carey and the Republican Tariff”, The Pennsylvania Magazine of History and Biography, July 1957, p. 280. Allan Nevins, The Emergence of Lincoln: Douglas, Buchanan, and Party Chaos, 1857-1859, p. 222. Jane Flaherty, “‘The Exhausted Condition of the Treasury’ on the Eve of the Civil War”, Civil War History, June 2009, pp. 259-260. Michael Burlingame, Abraham Lincoln: A Life, Volume I, p. 761. Abraham Lincoln Papers at the Library of Congress. Transcribed and Annotated by the Lincoln Studies Center, Knox College. Galesburg, Illinois (Letter from John W. Forney to Abraham Lincoln, Thursday, November 22, 1860). Bruce Collins, “The Democrats’ Loss of Pennsylvania in 1858”, The Pennsylvania Magazine of History and Biography, October 1985, pp. 535-536. Bruce Collins,”The Democrats’ Loss of Pennsylvania in 1858″, The Pennsylvania Magazine of History and Biography, Vol. 109, No. 4, (Oct. 1985), pp. 520-521. Michael Burlingame, Abraham Lincoln: A Life, Volume I, p. 682. Reinhard H. Luthin, “Abraham Lincoln and the Tariff”, The American Historical Review, July 1944, p. 49. Richard Hofstadter, “The Tariff Issue on the Eve of the Civil War”, American Historical Review, October 1938, p. 54. Heather Cox Richardson, The Greatest Nation of the Earth: Republican Economic Policies During the Civil War, pp. 104-105. Heather Cox Richardson, The Greatest Nation of the Earth: Republican Economic Policies During the Civil War, p. 105. John Sherman, Recollections of Forty Years, Volume I, p. 188. Stanton Ling Davis, Pennsylvania Politics, 1860-1863, p. 48. Reinhard H. Luthin, “Abraham Lincoln and the Tariff”, The American Historical Review, July 1944, p. 613. Stanton Ling Davis, Pennsylvania Politics, 1860-1863, p. 106 (North American, March 3, 1860). Allan Nevins, The Emergence of Lincoln, p. 253. Arthur M. Lee, “Henry C. Carey and the Republican Tariff”, The Pennsylvania Magazine of History and Biography, Vol. 81, No. 3, (July 1957), p. 291. David M. Potter, The Impending Crisis: 1848-1861, pp. 423-424. Reinhard H. Luthin, “Abraham Lincoln and the Tariff”, The American Historical Review, July 1944, p. 618. Don E. and Virginia Fehrenbacher, editors, The Recollected Words of Abraham Lincoln, p. 261. Coy F. Cross, Justin Smith Morrill: Father of the Land Grant Colleges, p. 49. Reinhard H. Luthin, “Abraham Lincoln and the Tariff”, The American Historical Review, July 1944, p. 624. Emerson D. Fite, The Presidential Campaign of 1860, p. 198. Michael Burlingame, Abraham Lincoln: A Life, Volume I, p. 671. Norman Graebner, editor, Politics and the Crisis of 1860, p. 110. Allan Nevins, The Emergence of Lincoln: Prologue to Civil War, 1859-1861, p. 465. CWAL, Volume IV, pp. 210-215 (Speech at Pittsburgh, February 15, 1861). Henry Villard, Memoirs of Henry Villard, Journalist, Financier, Volume I, p. 152. Michael Burlingame, Abraham Lincoln: A Life, Volume II, p. 14. Allan Nevins, The Emergence of Lincoln: Prologue to Civil War, 1859-1861, p. 448. Reinhard H. Luthin, “Abraham Lincoln and the Tariff”, The American Historical Review, July 1944, p. 614. Arthur M. Lee, “Henry C. Carey and the Republican Tariff”, The Pennsylvania Magazine of History and Biography, July 1957, pp. 294-295. Abraham Lincoln Papers at the Library of Congress. Transcribed and Annotated by the Lincoln Studies Center, Knox College. Galesburg, Illinois(Letter from Henry C. Carey to Abraham Lincoln, November 9, 1861). Reinhard H. Luthin, “Abraham Lincoln and the Tariff”, The American Historical Review, July 1944, p. 627. Phillip S. Paludan. “A People’s Contest”, p. 130. Gabor S. Boritt, Lincoln and the Economics of the American Dream, p. 209.